Who do you trust to do the metal work on your dream barn? Read this before you let just anyone do it! This summer my husband and I began remodeling our house. For the first 3 months Adam did the work himself. Initially, we hoped to be finished by September, but when September hit, surprise, it wasn’t finished. With Adam needing to get back to work and me needing this project finished, we decided it best to call in a crew and help finish up the “finishing out” details. Like cedar trim, metal soffit, framing in the ½ bath and setting the doors. Now, with my husband in the building industry you would think we would have contractors at the ready to help us out with this. Unfortunately, the ones we do know and trust to work for us, at the time, were knee-deep in projects of their own. So we called a few friends who had recently remodeled to Adam’s approval and got a referral. The contractor met us at the house the next day. He said he just finished a project very similar to this, so was familiar with working with the materials we had on hand and he could start Monday. Sounded like a perfect fit! So the workers came and worked. Two days later I went outside to check it out. Here’s what it looked like. We add another coat of stain, and another beam of cedar and here’s what it looks like. Pretty good, huh? Well, the next Saturday, it’s just Adam and I hanging soffit in the carport area. Now, I’m only 5’2”, fairly strong, but still only 5’2”. And there’s only two of us, setting 20’ long metal panels above our head. We truly needed at least 2 more hands, preferably four. He uses ladders and we get a system going. 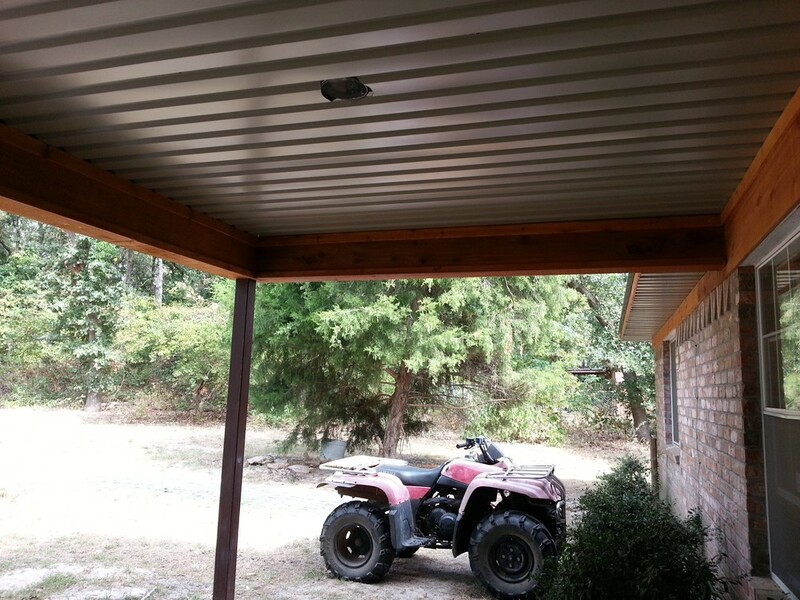 We made plans for lights to be inset in the soffit. So before we hung it, Adam cut out a hole to match exactly where the fixture sits. Imagine cutting a circle out of a piece of paper without beginning from the edge itself. You know, you fold the paper in half, make a starting slit, then open it back up and cut out the circle. Yes, that’s basically what Adam did, except it was with 20’ of metal. He started the cut by drilling 4 screw holes into the metal to slit it. Finally having a starting point he grabbed his nibblers and set to work to make the circle. I was amazed how he moved the metal around, just like I would a piece of paper. He changed hands, changed directions, bent back the excess, came from underneath, came from the top. He made sure the cut was clean and not jagged. I just want you to see the cuts my husband made. Now, look again, closer this time at the cuts the other guys made. From a distance, the work done by the people who said they knew how to handle metal looked fine. But when we looked closer we saw they really didn’t do a good job. So which one do you want doing your next job? The team at Southwest Metal Systems and Ameristall Horse Barns are committed to executing your job with excellence, without skipping out on the details. We genuinely care about building your dream, honoring God in the process and the joy spreads from there.